Sat., June 3, 2017, 9:28 a.m.
WASHINGTON – As President Donald Trump announced America’s withdrawal from a global climate change pact, infuriating allies far and wide, the man charged with defending the decision to the world kept his distance. Trump’s climate reversal is the latest challenge he has presented to Tillerson, a newcomer himself to the world of diplomacy who is still working to establish his credibility as an advocate of American foreign policy. Not only did Trump appear to overrule Tillerson’s advice concerning the Paris agreement, but the decision fanned fears of the U.S. abdicating its global leadership role and shunning international consensus on the world’s most pressing issues. Tillerson wasn’t the only Cabinet member to skip the Rose Garden ceremony where Trump announced his decision, but his absence was perhaps the most glaring. He met Trump only hours earlier in the White House. Tillerson’s aides maintained that he decided to follow his own schedule, which had him in his seventh-floor office on Thursday afternoon as Trump was speaking. Aides could not say if Tillerson watched the president on television. But he will be almost surely be required to recite the rationale for Trump’s pullout from the agreement cutting carbon emissions, given that his agency led the Paris deal negotiations and will now have to manage the international fallout. Tillerson called Trump’s action a “policy decision.” He insisted the U.S. should be proud of its “terrific record” in cutting greenhouse gas emissions, even before the Paris pact took effect late last year. Trump’s announcement is renewing questions about the level of Tillerson’s influence on his boss’ mercurial foreign policy decision-making. Tillerson is the former CEO of Exxon Mobil, the world’s largest oil company and one that spent years examining climate science until grudgingly accepting the dangers of global warming. Still, his support for the Paris deal was insufficient to persuade Trump to stay in. This weekend, Tillerson visits Australia and New Zealand. Both countries have been outspoken in their climate change concerns and support for the Paris agreement. Tillerson is sure to hear an earful about the issue in the days, weeks, months and years ahead. “Tillerson’s credibility issues right now are far broader than just the Paris accord,” said Cecile Shea, a retired U.S. diplomat, now of the Chicago Council on Global Affairs. She said the withdrawal compounded suspicions about U.S. leadership since Trump left the Trans-Pacific Partnership trade deal and questioned the NATO alliance. Tillerson’s argument to Trump was that leaving the agreement would diminish U.S. influence in encouraging other countries to reduce their emissions, aides said. He didn’t argue that it would affect U.S. efforts to reduce American emissions. Tillerson said repeatedly in his confirmation hearing in January that he accepted climate change is real and believed it was important for America to “have a seat at the table” in international discussions on the matter. Exxon, his former company, was on the record supporting the agreement and publicly encouraging Trump not to withdraw. Still, Tillerson’s support has been quieter than that of his predecessor: John Kerry. As Obama’s top diplomat, he played a major role persuading other governments to commit to cut their own emissions, even when it created political problems for them at home. Paris deal supporters, including Kerry, predicted Trump’s withdrawal would cause almost irreparable damage to America’s standing abroad and potentially its ability to negotiate future diplomatic agreements. “It is a global stain on our credibility that we will spend years, if not decades, working to remove,” Kerry said. But Ronald Neumann, a former U.S. ambassador who heads the American Academy of Diplomacy, noted Tillerson, like all secretaries of state, would occasionally lose policy battles. 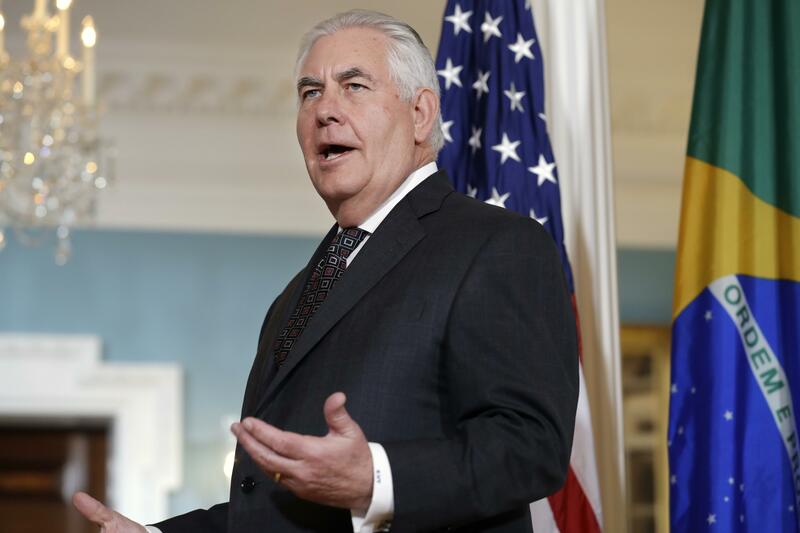 “I don’t think it particularly weakens him,” Neumann said, though he suggested a lack of clarity over the role the administration intends to play internationally could still be problematic for Tillerson’s diplomatic efforts. Thursday wasn’t a total loss for Tillerson. It began with Trump backtracking on a campaign pledge to move the U.S. Embassy in Israel from Tel Aviv to Jerusalem. Tillerson, Defense Secretary Jim Mattis and other members of the national security team strongly advised against relocating the embassy. Published: June 3, 2017, 9:28 a.m.